Living Your Wild Creativity provides workshops, online courses, art classes, FB groups, blogs, inspirational dialogues via videos, art resources and more to encourage a pathway to self-discovery and expressive explorations. Workshops are designed to help you explore, learn and express your own unique creativity by trusting your intuition, gaining knowledge of art elements and courage as you go. Living Your Wild Creativity is based in Sonoma County, CA, and give workshops nationally. “Fortunate indeed are those who take a class from Suzanne Jacquot and Julie Schumer. This is not the usual experience, where there is normally one platform, or one focus. They both have crafted, as a team, new approaches to content: tools, colors, size, composition. Yes, these are the "under layers", just like any other class you might have taken. But it goes far beyond that. Abstract Art Studio Practice is a great way to commit to your own art practice on a monthly basis or for the full 6 months. Each month, we will explore an important topic on one of the elements for making strong art in 4 unique 3 hour sessions. 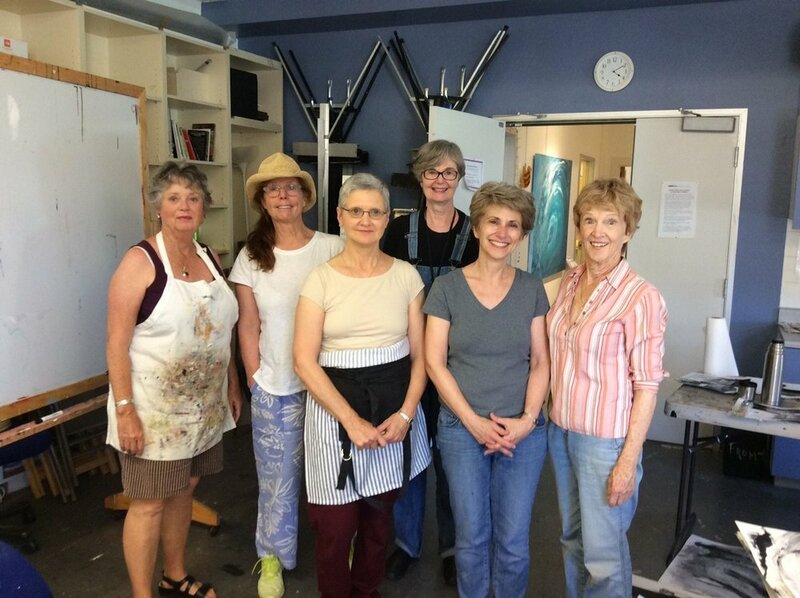 You will learn what makes for a good painting, gain confidence, trust your tuition, experience exercises relating to the topic, explore personal variations and preferences, and create original works of art each week. ALL LEVELS WELCOME. We will meet on Tuesdays at 1-4PM. November 6, 13, 20, 27---This month is all about the power of composition/eye flow, dividing space/ design and activating your surface. You will learn how you naturally divide up space and what is pleasing and not pleasing to you. You will learn how to move throughout the image and create strong focus in your work. You will learn the idea of expansiveness and grouping. You will learn many exciting new ways to start a painting. FULL. Join us for January! January 8, 15, 22, 29---This month you will learn the different ways to structure a painting from Grid to free form. You will explore various structures for setting up a painting and how to choose what works the best for you so that your paintings are strong and clear. February 5, 12, 19, 26---This month you will practice developing shapes and contrast and how this can really boost a painting's interest to the viewer. You have lots of fun ways to explore these topics and their valuable contribution to your art. You will work with geometric and biomorphic shapes, learn the value scale and look at edges between objects. 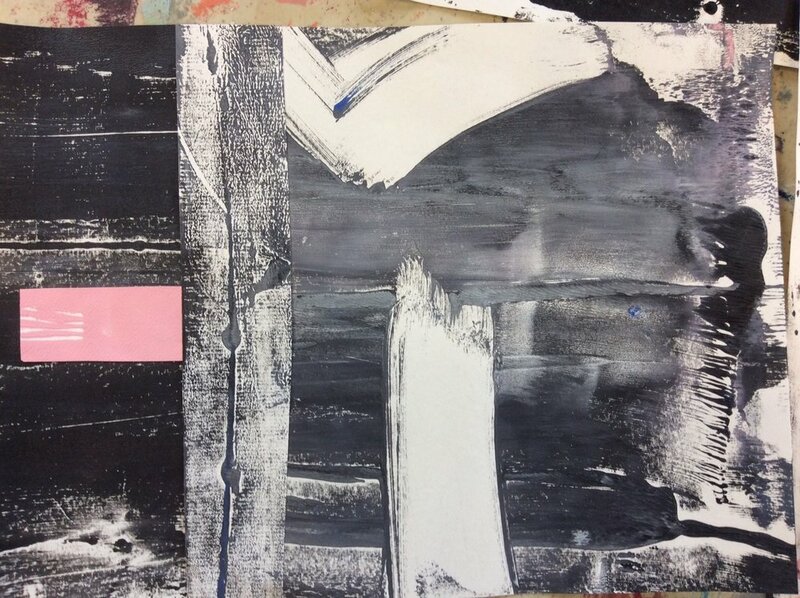 April 9, 16, 23, 30 ---This month you will explore line and mark making. You will experiment with charcoal, graphite, ink and acrylic pens as well as acrylic paint. We will use line as a source for directing eye flow, creating rhythm and adding personal expressions. Some techniques you will learn are automatic drawing, veiling and obliteration. Through exercises and free time you will learn your own visual mark making vocabulary and how line can help direct the flow in your painting. May 7, 14, 21, 28---This month you will explore your own personal rhythms, patterns and movements and how they can enhance your paintings. You will use rhythms and patterns to help enliven your painting much like various instruments give a richness and depth to music. June 4, 11, 18, 25---This month Color Basics is the topic of exciting learning. You will learn the three properties of color, how to use them powerfully and easily to create dynamic art. You will learn simple basic terminology of color, the color wheel, do fun exercises and create original images with moods and harmony. August 6, 13, 20, 27---This month you will explore different ways to create wondrous palettes for your art using nature, mixing your favorite colors and the wisdom of the masters. Materials List: 9" x 12" or 11" x 14" Mixed Media Workbook, 1" artist tape, scissors, ruler, glue stick, brushes of various shapes and sizes, plastic scrapers, shapers of your choice, palette knife, 3 or 4” brayer, paint clothes, 9B graphite ebony prisma color pencil, black chalk pastel, water soluble 9B graphite stick, art gum eraser, paper towels. For LIVE ONLINE participants: 15” x 22” and 22” x 30” heavy mixed media paper, mixed media paper 18” x 24”. Needed each class. Suzanne Jacquot earned a BFA at UC Berkeley in psychology and design, an MFA from Mills College in sculpture and photography, and an Art Therapy Certificate from Sonoma State University. She has shown her work in various galleries and museums throughout the Bay Area, taught Abstract Art at Marin Museum of Contemporary Art, Benicia Arts Center, Studio4404 and online. www.SuzanneJacquotArt.com. “I highly recommend Suzanne’s Studio Practice course. In her weekly classes I have learned the value of daily work and setting clear intentions. Each week is filled with demonstrations, challenging exercises and plenty of lively discussion. The weekly format allowed me to digest the new concept and work on it throughout the week in my own time and space. 1) Grow your art and soar to new heights working with multiple media. 2) Learn steps to let go of the fear "ALL" artists have at one point or another. 3) Learn to scale up with your work. 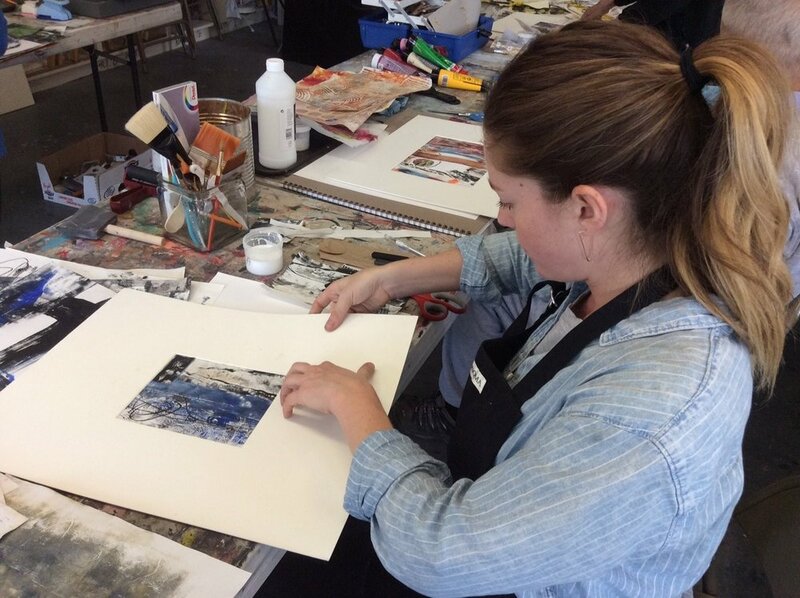 5) Learn the craft of collage: how to glue down paper and other media using acrylic mediums. The goal is to get it down nice and flat...no bubbles! 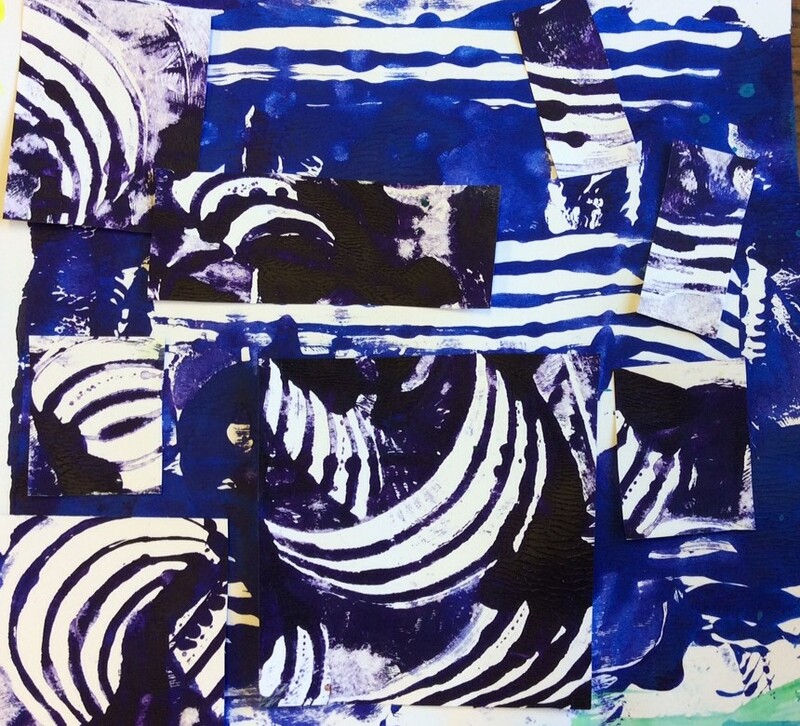 6) How to create an image transfer (Xerox transfer) in your work using acrylic gel medium...and how that process can work beautifully with the process of collage. 7) How drawing, paint, stenciling, stamping, etc...can create that sense of unity and movement you need in an artwork. 8) How do we know when our art piece is finished? Learn how to recognize that moment when it is time to just step back, take a breath and just look. 9) Learn how to put that professional finish on your art piece and how to make it archival. Materials to Bring: at least 4 small wood panels (16” x 16” inch or smaller) and at least 1-2 larger panels (no larger than 36” x 36”). Bring, any books, magazines, and/or collage materials you particularly want to use; bring laser printed black and white xeroxes for transfers and/or color laser printouts (copies from Kinko’s will work great); paint brushes, scrapers, brayer, scissors, mat knife, rag, sponge. An artist with a following in the Bay Area and beyond, Cutlip’s exhibition history includes San Francisco, New York, Chicago, and Vancouver, BC. In 2014, he won the Alameda County Arts Commission Purchase Grant. Cutlip’s work has been acquired by the corporate collections of Microsoft, Bloomingdales, Kaiser Permanente and the David & Lucile Packard Foundation, and is part of singer/songwriter Sarah McLachlan’s private collection. His work is also featured in the Triton Museum of Art in Santa Clara. mAY 25, 26 FRIDAY, Saturday——-Studio opens at 10AM, Instruction 11AM-4:00PM, Studio closes at 5PM each day. This unique workshop is for your own creative discovery and implementation of those finds. You will explore the creative possibilities of “the materials at hand” which may include both traditional and non-traditional resources such as collage, painting, found materials, and mark making. Through a wide array various exercises. you will be able to break out of creative blocks and self-imposed barriers. The workshop will also dive into group interaction in collaborative experiences. It is designed to give each participant maximum freedom to explore and gain confidence in their own ways of expressing. Students may bring works-in-progress to move toward completion and there will be limited time for one-to-one look at your process, explorations and directions. Bring a Friend and Save: $950 for two. Students are asked to bring watercolor paper, Bristol paper or mixed media paper, photos, xeroxes, acrylic paints, inks, graphite bars, matte medium, YES paste, or UHU glue sticks, plastic spatula, paint brushes, other tools as desired, rag, paint clothes, sponge, scissors. Carl Heyward is a working artist, NEA grant recipient, former MFA instructor at SF Academy of Art University, arts writer and founder of Global Art Project, a mixed-media collaborative cooperative with a membership in 12 countries. He is affiliated with The Fourth Wall Gallery in Oakland, CA, artist-in-residence at The Schools of The Sacred Heart at The Flood Mansion, San Francisco, and continues to exhibit widely including NYC, Kranz, Slovenia: Mazatlan, Mexico; Venice, Italy; Senegal and Ghent, Belgium, in 2017. His work is in collections held by SF-MOMA, NY-MOMA, Yale University Art Library, the National Gallery of Australia and the Brooklyn Museum. Have you been wanting to push your envelop and paint just a bit larger but haven't done it yet? This Intensive workshop might be just perfect for you. You will learn techniques to make larger images than you have before. This workshop is a combination of guided exercises and independent study. In a supportive environment we help you set your intentions, encourage experimentation, and demonstrate ways to bring your heart's desire to fruition. This workshop is for intermediate and advanced students or artists who would like time to do independent study in a creative art space. Come enjoy Sonoma Wiine Country and the beautiful vineyard views in Suzanne's new Dream Studio/Studio 4404. Bring a Friend and Save: $1600 for two. Julie Schumer is a self taught artist. Her work is shown in galleries across the United States and is in many private collections. She lives and works in Santa Fe, NM and in the past several years began teaching loosening up painting workshops. Here is a little video we made showing one of the participating Artist, Jamie Madison, and her very exciting work using a whisk broom! Three full days of Immersion in Abstract Expressionism with the acclaimed and gifted French artist Jean-Charles Millepied and Suzanne Jacquot, artist and owner of STUDIO4404. The mornings will be focused on warm-up and learning exercises, practice and demonstrations; the rest of the day each artist will explore their own directions. Jean-Charles and Suzanne will provide one-on-one mentoring as well as interactive discussions in an environment that is safe and comfortable for all participants. We look forward to providing a pivotal experience in your creative and professional breakthroughs. Studio4404 will be open from 9:30AM-6PM each of the three days. Teaching and mentoring hours will be 10AM – 12:30PM and 1:30PM – 4PM each day. This is an Intensive workshop for Mid-level to Advanced acrylic painters and mixed media artists with a maximum of 10 to 12 participants. Cost: $600. There is a materials list which will be provided upon registration. Jean-Charles Millepied was born in Bordeaux, into a family that had six generations of artists in the world of music, opera singing and dance. His painting is the multicolored expression of this “inner necessity”. His art of ardour reveals to us the scenery of his soul, deployed as many sources of joy, emotion, and a delight for the eye, where one wishes to stay. Here, the pictorial space is so immense that its qualities seem infinite, as such there is always some room left. Each and everyone can lose themselves and find a contagious serenity, a true beauty where colors, music and poetry converge. Suzanne Jacquot lives and works as an abstract artist in West Sonoma County. She describes herself as a native Californian whose passion is living with nature, expressing and exploring who she is and sharing with others. She is currently exploring the gesture and its energy, connection and meaning in relationships. Susan Stover is a San Francisco Bay Area artist who creates paintings and sculptures that explore themes of cultural identity and mythology. With the study of ethnic patterns and of utilitarian and sacred objects in non-western cultures, her work embraces ritual, tradition, and meditation through repetitive labor. Susan received a MFA from California College of Art in Oakland, California and a BFA from Miami University in Oxford, Ohio. Her paintings are in many private collections. Her work was featured on the cover and in the lead article of the Surface Design JournalWinter 2016 issue and has been included in The Art of Expressive Collage by Crystal Neubauer, Studio Visit, and Gathering Clouds – A Magazine of Contemporary Art. She teaches workshops in her northern California studio, other locations in the U.S., and internationally. Liberate your ability to use line and marks in your paintings and delight in our own inner vocabulary as you create gestural abstracts. In this hands-on, experiential workshop you will use large and small, common and uncommon tools/brushes to explore, learn techniques and create drawings and paintings with your own unique marks. A great workshop to let loose, trust your intuition, follow your urges and discover new ways to express you! We will be using acrylics, inks, house paints, graphite, and charcoal. Join us as we splash, fling, pour, drip, drizzle and smear our way to creative harmony. All levels welcome. Bring a Friend and save: $850 for two. Things to Bring: paint brushes of all kinds, scrapers, shapers, palette knife, brayer roller, paper towels, artist tape, 9" x 12" or 11" x 14" Multimedia workbook, sponge, spray water bottle. Heather Wilcoxon lives and works in the Bay Area . She received her MFA from the San Francisco Art Institute in 1988. She has exhibited both nationally and internationally. Her work is in several permanent collections including The American University Museum, Washington DC, The Fine Arts Museum, Auchenbach Foundation of Graphic Arts in San Francisco, the De Saisset Museum and Triton Museum in Santa Clara and the Di Rosa Preserve in Napa, California. She has received several fellowship awards. Two from the Pollock/ Krasner Foundation,New York. Three painting grants from the Buck Foundation in Marin County and a residency fellowship from the Djerassi Artist Residency Program. She has also been nominated for a SECA Award through the SFMOMA . She recently was received, The 2019 Distinguished Women in the Arts Award from the Fresno Art Museum. She is represented by Jack Fischer Gallery in San Francisco. express your wild creativity----cut loose! get bold! Find your marks! Go wild with us! Bring your courage, your curiosity, your love of creating for this 4-day intensive abstract acrylic workshop. This workshop is chock full of learning, exploring, delving, trusting, getting wildly creative. You will be guided in a series of structured loosening up exercises, using acrylic paint and a variety of drawing tools in the creation of nonobjective abstract paintings. You will gain courage, build trust in your artistic choices, grow your skills of design, explore your own inner painting language and nurture your creative spirit. You will explore tools and marks and how your signature marks enliven your paintings. Plenty of free painting time as well. Come prepared to rediscover Santa Fe, the art of play and tap in to your inner wildness! All levels welcome. Julie's spacious art studio is located across the street from MeowWolf. Cost: $895. $795 for returning participants.